It’s attributed to being said by Weegee (Arthur Fellig) in the late 40’s, and it’s a phrase that comes through my head every time I am in one of those “is this really happening” moments. A couple of Saturday’s ago, I was driving to Eureka Springs to shoot a really cool project for a client (I’ll post more about that one soon), and I decided to take the scenic route. We recently had a big flood at War Eagle Mill, so I thought I would take that route to see if there was any damage to the War Eagle Bridge. As I pulled up to the bridge, I had one of those moments… I’ve actually had a lot of those moments in my career, and I’m very thankful for all for all of them. There are so many things that make a great image, but one of the biggest ones is luck. That’s where the phrase f8 and be there comes into play. If you don’t go out, and you don’t have a camera… you can’t create a dynamic image. One of my tricks is to keep a camera on my passenger seat, and keep it on either shutter or aperture priority. I personally am a manual shooter, but keeping a camera on an auto setting helps for those times when you come across something and you want to jump out and shoot. It makes it easy to grab a couple of quick shots, and then change over to a manual mode to perfect your exposure. It was something I used to do when I worked at the paper, and it’s something I still try to do when I’m driving back roads to my destination. So back to the story about that Saturday… War Eagle Bridge is a one-lane steel bridge built in 1907 that features stone piers and wooden planks. Majority of the time when I drive over it, I share the space with pedestrians who are on the bridge looking at the creek below, or snapping photos of the mill. I have to say that this was the first time in my 20 years of living in NWA that I’ve had to share the bridge with a sheep… yes, I said a sheep. I have no idea where he came from, but he was hanging out on the bridge with a couple who he followed onto the bridge. I naturally grabbed my camera and decided to snap a few photos. I’m not really sure where he came from since there were no other sheep nearby, but I really enjoyed the time I spent with him. 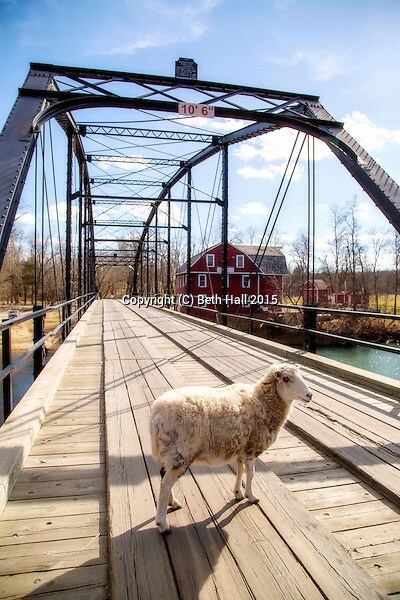 And I’m so thankful for the couple on the bridge that patiently walked in and out of my frame to lead the sheep into a good spot on the bridge.